Should you invite children to your wedding? The decision on whether to invite children to your wedding can be tricky,and sadly whatever your decision you’re bound to upset someone. After all no one is more passionate then “Mama Bear” who thinks her children are angels and why wouldn’t you want them at your wedding? Once you acknowledge that someone is going to cause a fuss, you can concentrate on making the best decision for you. I know my husband and I would relish the thought of a wedding or party where children are not invited as this gives us the rare chance to enjoy ourselves without the responsibility of our children. But that said, what if the wedding isn’t local? The chances of someone having our 3 children for a whole weekend is unlikely, so we might have to decline such an invite. With over 10 years experience as a planner I can see the benefits of having children at your event as frankly they can create cute moments with some fabulous photographs! I’ve had many brides say to me the children have made the wedding for them. The key is to keep them entertained, look at this past post from 2012 for some advice. You may think why should I spend time on organising the children but remember weddings can be tediously boring for a child and what happens when a child is bored? Mischief and Mayhem – not a good mix for a wedding! But, at the same time children can cause disruption. Think screaming in the ceremony, running around during the speeches and taking up the dance floor in the evening. It depends on how many children and how well behaved. I’ve seen situations where parents are not watching their children, I’ve had to stop children from chasing ducks into a pond and escorted a small toddler who kept leaving the marquee at night whilst his parents were snoozing on a sofa! Location: if your wedding is local to the majority of guests this is easier for them to arrange childcare as is unlikely to necessitate an overnight stay. So if your wedding is not local, and you don’t want to invite children, call your guests to give them a lot of early notice. 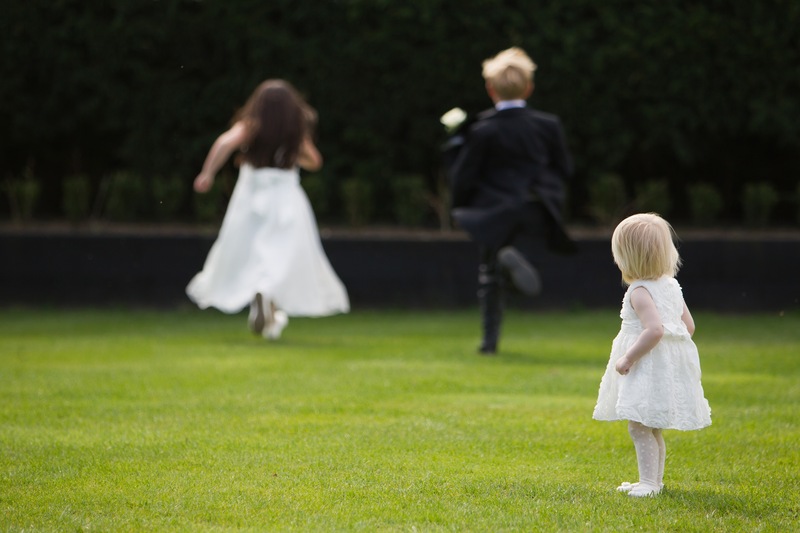 Inviting small children, under 12 to a wedding often causes more problems that it solves. The little ones are so cute, it can take away from the bride’s day. They get bored and by the time the dancing starts, they can spoil it for their parents too. When the first dance happens, they can be a trip hazard. If the couple has taken wedding dance lessons, they could be using the whole floor and no one else knows they need the whole floor. After all the time, money and practice, only to step on a little one not only hurts them, but spoils the first dance. Weddings are for positive memories, not spoiled moments. With lots of notice, weeks of time when the invitation arrives, there is no reason parents can’t find a family member, neighbour, professional baby sitter to care for the kids so they too can enjoy the wedding. Thank you for your views, funny enough it’s never the children that seem to cause chaos on the dance floor during the first dance. It’s invariably adults standing too close, or trying to film it, getting in the videographer or photographers way. I’ve had to usher guests out of the photographers way many times in the past which is a shame as the photos from the first dance are always so moving.